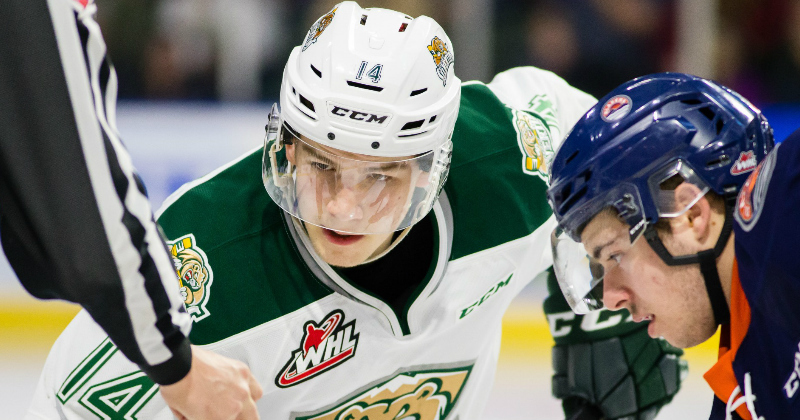 04/15/2019 - The Washington Capitals announced today that the club has re-assigned forward Riley Sutter from the Everett Silvertips of the Western Hockey League to the Hershey Bears. The announcement was made by Washington's senior vice president and general manager Brian MacLellan. Sutter, 19, collected 41 points (14 goals, 27 assists) in 38 games with Everett this season, finishing fifth on the team in scoring. He also appeared in three playoff games with the Silvertips, notching an assist. The 6-foot-3, 210-pound forward helped Everett to the WHL Finals last season, skating alongside current Hershey center Garrett Pilon. Sutter tallied a career-high 53 points (25 goals, 28 assists) during the 2017-18 campaign, and also added 19 points (nine goals, 10 assists) in 21 playoff games. In 204 career WHL games with Everett, the Calgary native collected 137 points (60 goals, 77 assists) and 156 penalty minutes. Sutter, the son of longtime NHL forward Ron Sutter, was selected in the 3rd round, 93rd overall, by the Capitals in the 2018 NHL Draft. The Bears open the 2019 Calder Cup Playoffs presented by CJ's Tire and Automotive at the Bridgeport Sound Tigers for Game 1 on Friday, Apr. 19 at 7 p.m. and Game 2 on Saturday, Apr. 20 at 7 p.m. at the Webster Bank Arena. Hershey will host Game 3 on Tuesday, Apr. 23 at 7 p.m., and if necessary, Game 4 on Thursday, Apr. 25 at 7 p.m. Tickets to both games at Giant Center will go on sale, tomorrow, Tuesday, Apr. 15 at 10 a.m.Tickets will be available at the Giant Center Box Office, by calling 717-534-3911, and online at Ticketmaster.com.